The Asia-Pacific, and in particular the Asia-Pacific Economic Cooperation (APEC), has remained a focus of Vietnam’s foreign policy, Deputy Prime Minister and Foreign Minister Pham Binh Minh said at the 30th Ministerial Meeting in Port Moresby, Papua New Guinea, on November 15. This year marks the 20th anniversary of Vietnam’s APEC membership. Therefore, the country will continue to work together with other members to build an Asia-Pacific community of peace, stability, dynamism, inclusion, connectivity, and prosperity, he said. Over the past nearly three decades, APEC has proven its strong vitality, especially during difficult periods, he said, adding that in 2017, APEC affirmed its core values in free and open trade and investment, as well as its strong commitments to multilateral trade. It has made marked progress in economic linkage, regional connectivity, quality and inclusive growth, and human resources development, the official noted. Given the increased connectivity of the digital era, he underlined the need for APEC to carry forward its locomotive role in spurring sustainable, innovative and inclusive growth, as well as economic connectivity in the region. Minh also highlighted APEC’s role in trade and investment connectivity and liberalization and the settlement of global challenges. APEC should take the lead in coordinating regional multi-layered economic connectivity mechanisms towards the formation of a Free Trade Area of the Asia-Pacific (FTAAP) and promoting an open and transparent multilateral trading system based on the law, balance, and inclusion - with the World Trade Organization (WTO) playing the central role, the official said. He urged APEC to continue performing its role as a pioneer in structural reform, setting up central networks and innovative incubators, and promoting the business and startup spirit in order to turn the Asia-Pacific into the world’s leading center of technology and education. APEC also needs to take decisive steps towards implementing the action plan on inclusive growth and enhance the capacity for its members to access digital technology, adapt to and cope with changes and risks, and harness cooperation and connectivity. Deputy PM and FM Minh called for joint efforts within APEC to build a strategic and ambitious Post-2020 Vision which aims to serve the benefits of people and businesses. In his opening remarks, Papua New Guinea’s Minister of Foreign Affairs and Trade Rimbing Pato said that with the theme “Harnessing Inclusive Opportunities, Embracing the Digital Future”, the 30th APEC Ministerial Meeting is of great significance as it will review the APEC’s realization of commitments over the past years and set forth measures to bolster regional economic connectivity and growth, and maintain the Asia-Pacific’s role as momentum of global growth and economic connectivity. 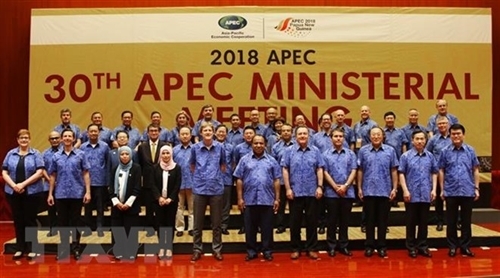 The participating ministers agreed on the need for APEC to maintain its economic cooperation and pace of connectivity, as well as deploy open and free trade and investment, complete Bogor goals in 2020 and gearing towards the formation of the FTAAP. They committed to realizing the APEC Connectivity Blueprint, focusing on infrastructure and supply chain connectivity, institutions, and people, among others. The ministers consented to accelerate the implementation of the Cross-Border E-commerce Facilitation Framework and the Internet and Digital Economy Roadmap adopted in 2017, while handling non-tariff barriers and helping micro-, small-, and medium-sized enterprises improve their competitiveness and access the digital economy. They concurred to continue their support for the law-based open and transparent trading system, and improve the function and operational efficiency of the WTO. The ministers also highly valued the role and contributions of APEC to the implementation of the United Nations Sustainable Development Goals.